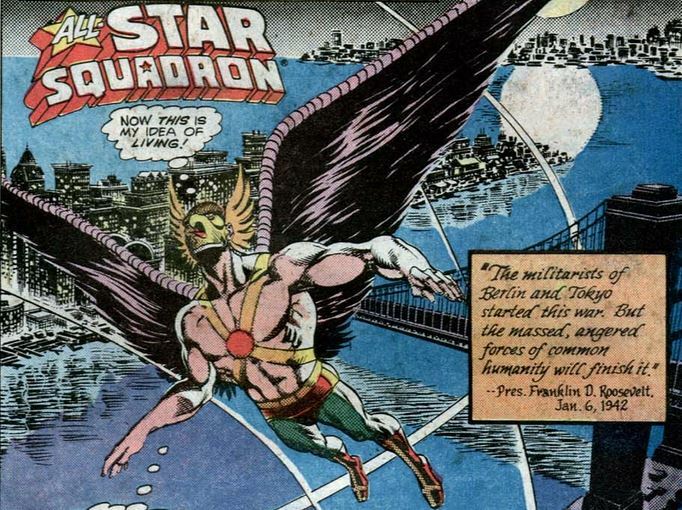 Hawkman does what I would do if I were Hawkman - just go around flying. 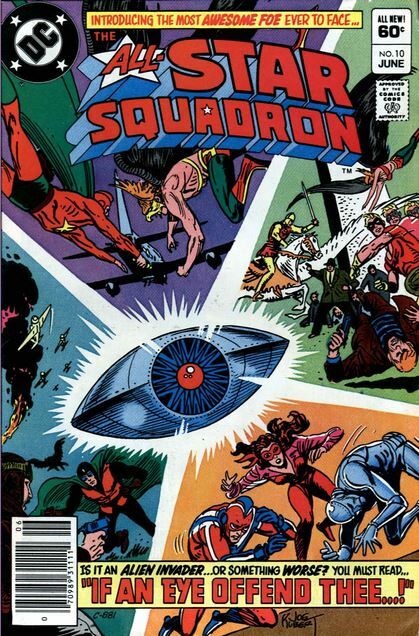 Nearby, a flight of B-17s is passing by and inside one of them is Ted Knight: Starman. 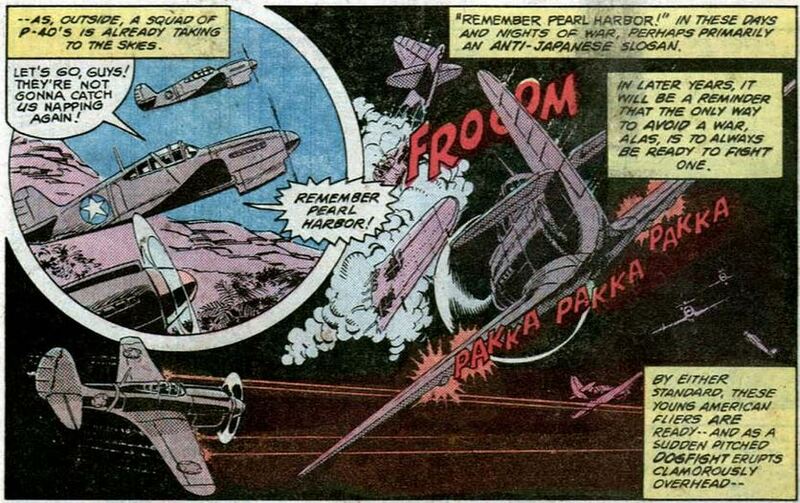 A beam from the UFO kills the engines of one of the B-17s. 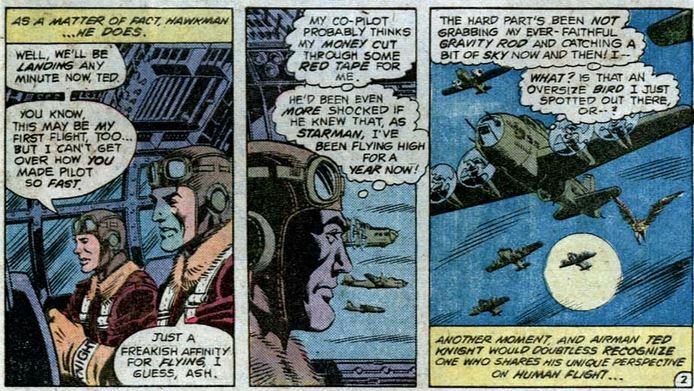 Leaving the plane to his co-pilot, Ted decides that Starman is needed. 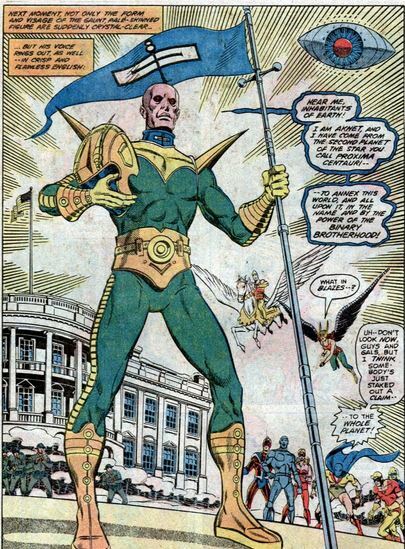 This is why I think enlisting was the wrong move for the JSA - when things get crazy they'll go into costume anyway because they are more powerful that way. 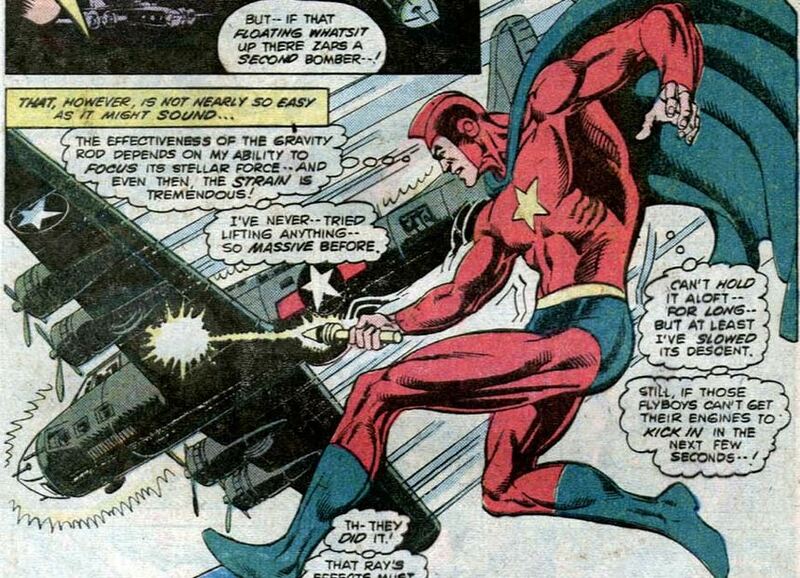 Starman slows the plane's descent long enough for the crew to restart the engines. Carter approaches the UFO. 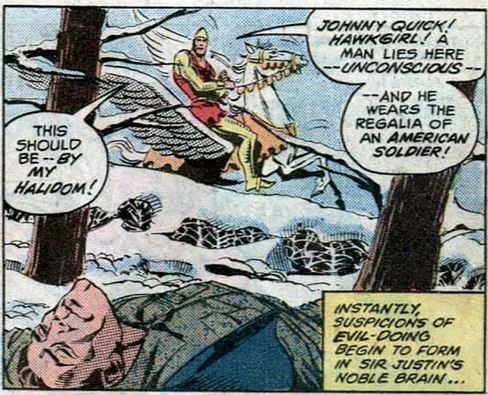 Someone falls out of it, Hawkman catches that someone. This person will later be found to be dead. 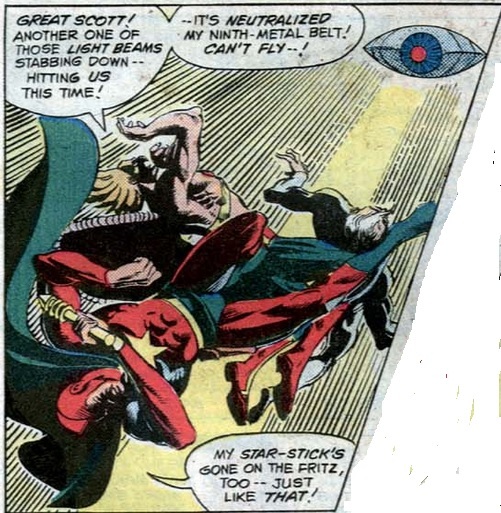 Just as Hawkman and Starman are about to pursue the ship, they are hit by a beam and their power to fly is temporarily neutralized. 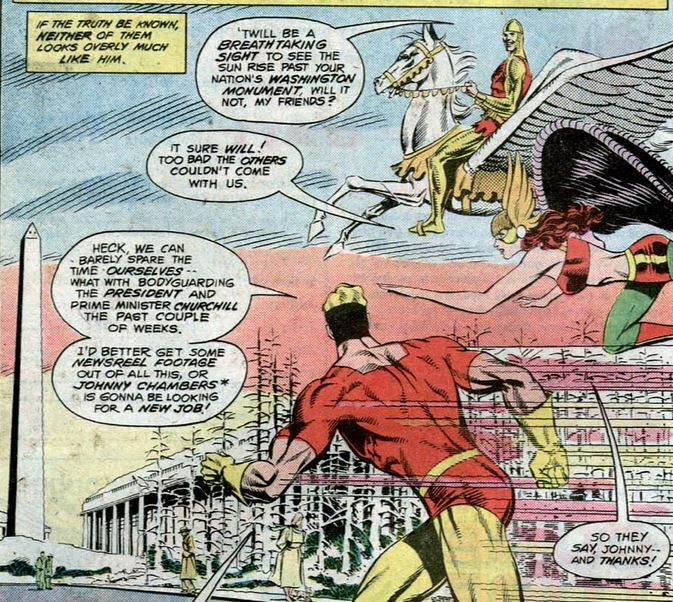 Shining Knight, Johnny Quick, and Hawkgirl are in Washington D.C.. 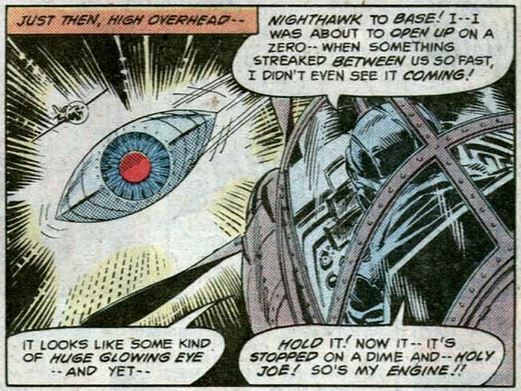 I agree with Johnny, that new Hawkgirl mask beats the old 'shrieking hawk' motif. The trio comes across a fallen soldier. 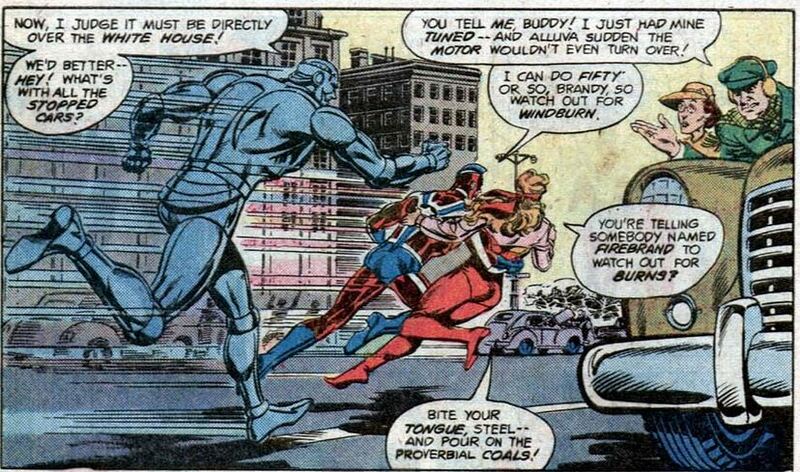 Johnny Quick finds the perpetrators and does well initially. But Chambers is too cocky and the thugs get the better of him. He recovers though, and manages to outrace the bomb's triggerman, and throw out the sticks of dynamite before it could blow up under the Washington monument. Over a remote Pacific island controlled by Americans a dogfight between P-40s and Zero fighters is under way. The UFO shows up once again. 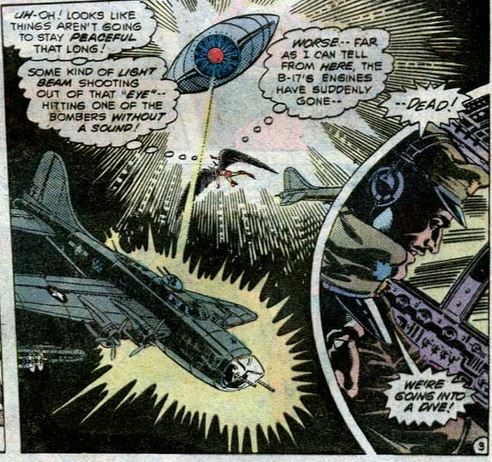 The mysterious craft uses it's beam to kill the engines of the fighters and the pilots are forced to eject and use their parachutes. 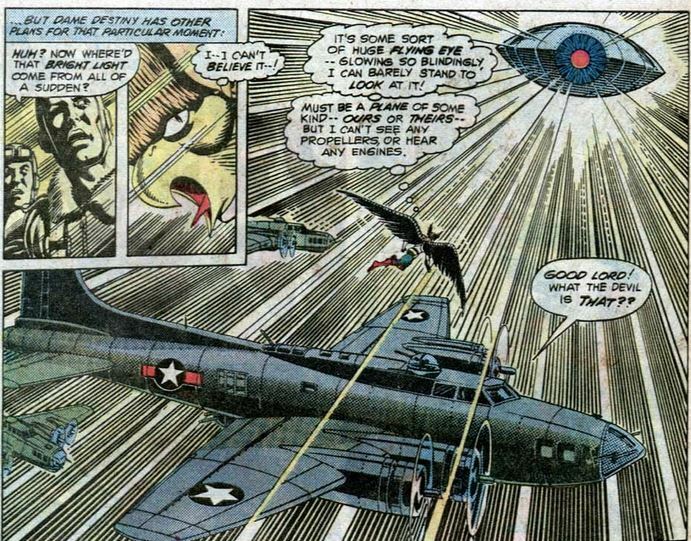 A Japanese pilot makes it to the ground and he encounters Dr. Mid-Nite. After this disruption the UFO disappears again. In another side note to history we look in on FDR and Churchill as they decide on the name 'United Nations'. We also have a look at cold Crimea, where the Germans and Russians are fighting. The UFO makes an appearance and stops every tank in its tracks. Something different happens here. 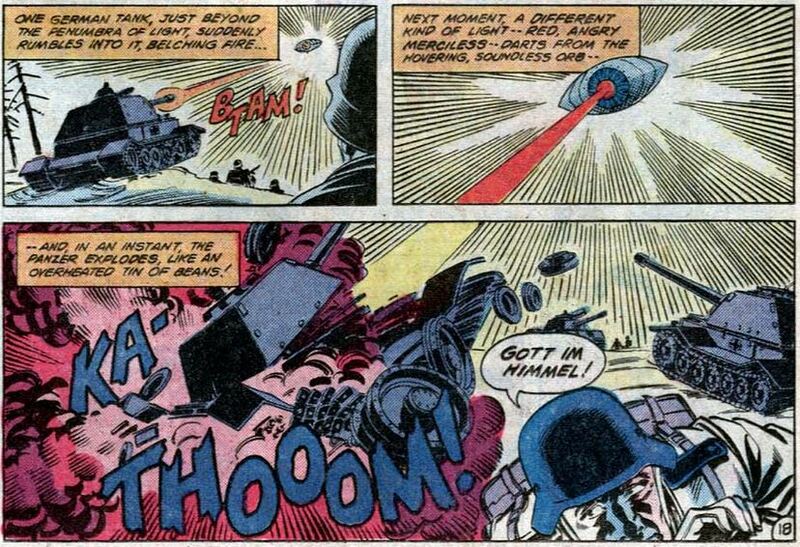 A German tank fires at the craft and is met with a different beam - one that destroys. Then the UFO goes away and the tank battle continues. Weird. 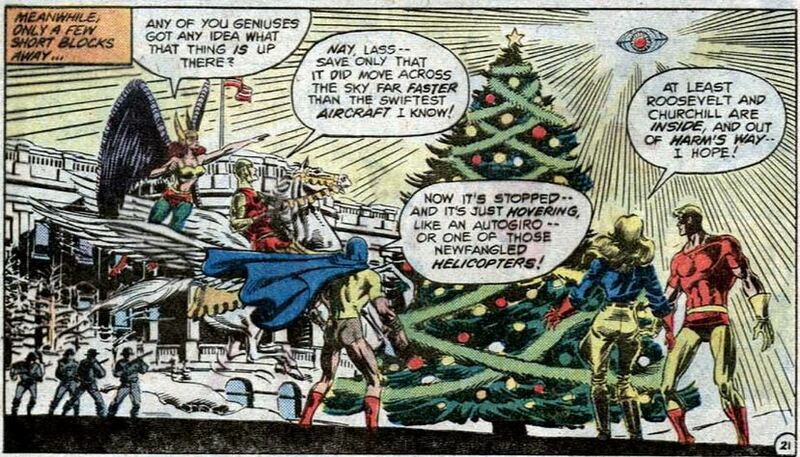 In Washington the UFO makes another appearance and knocks out Steel and Robotman. 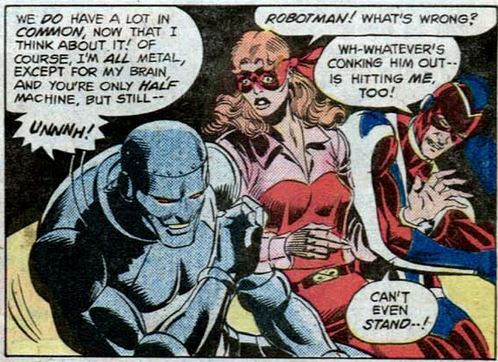 Robotman is nearly all machine while Steel is powered by micro motors. That's two of the most formidable All-Stars who might not be able to fight this UFO if that's what it comes down to. When the craft leaves, both mechanical heroes recover and rush to the White House with Firebrand. Here is everybody in front of the White House lawn looking at the object. Someone is materializing in front of the heroes. 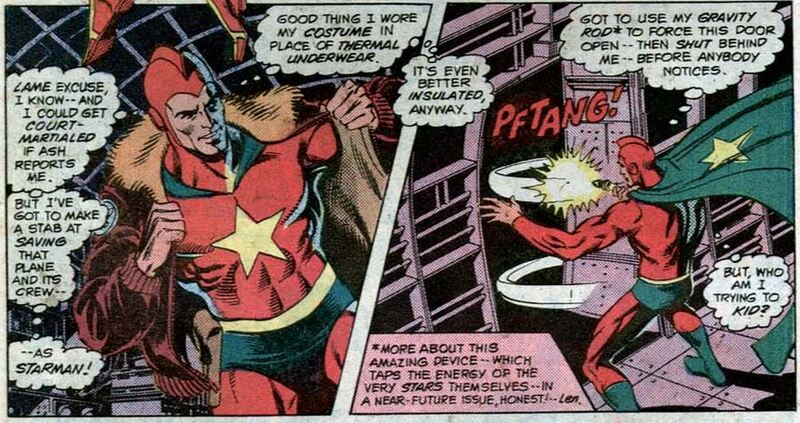 The impulsive Johnny Quick makes a move. It's all so ill-advised, they should find out who it is first. Well, at least it's a mystery no more. 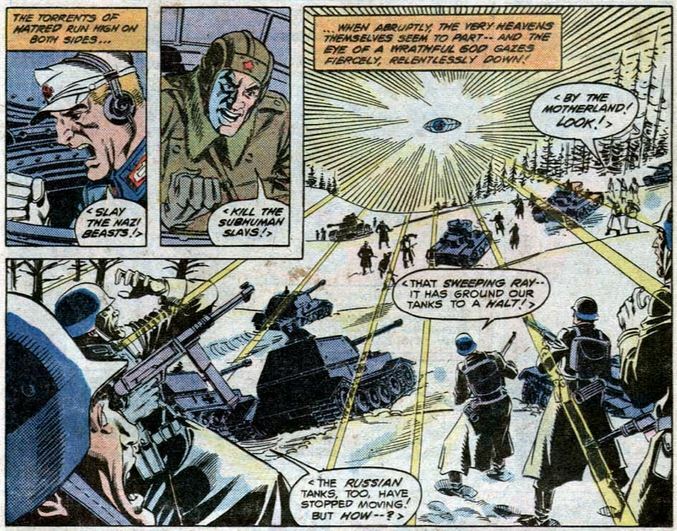 In the middle of World War II, we have an alien invasion! 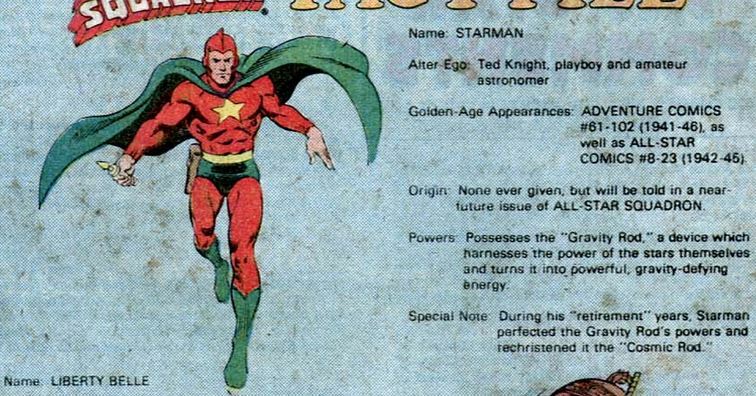 Look at that, Starman's origin was never given. All those years in the 40s he was a true 'mystery man'. 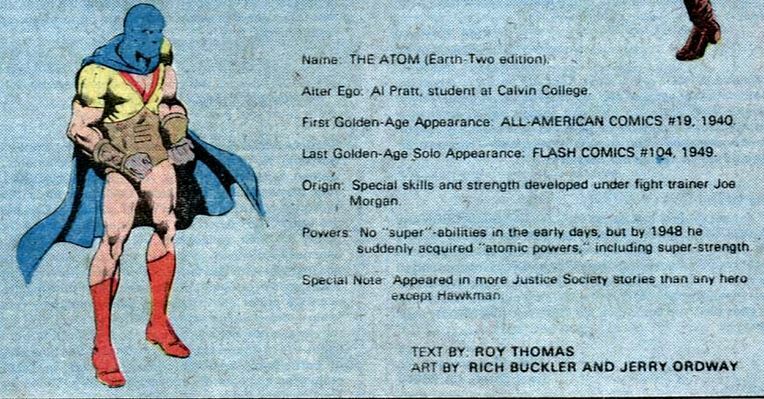 And here I thought Roy Thomas invented Liberty Belle.